The Canon EF 28mm f2.8 IS USM Lens is the world's first wide-angle prime with Image Stabilisation and is an ideal all-purpose lens for full frame cameras and features Canon's classic compact prime design. The fast f2.8 maximum aperture and Image Stabilisation (IS) enables hand-hand photography without the need for flash and permits the use of shutter speeds up to four stops slower than normal. A seven-bladed circular aperture provides beautiful bokeh, while Super Spectra coatings reduces flare. Canon's ultrasonic autofocus motor (USM) provides fast, near silent focusing with full-time manual-focus override for fine adjustment. 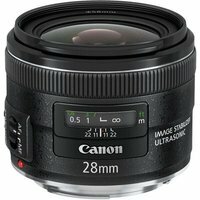 Weighing at just 260g and measuring a compact 68.4mm x 51.5mm in size, the EF 28mm f/2.8 IS USM is a great, lens that you can take everywhere.